The Friends of the L.D. Fargo Public Library, founded in 1987, is a volunteer organization whose mission is to: provide support services to library staff and board; sponsor programs designed to improve the social, cultural, and intellectual life of the community; and promote the library in all phases of community life. Consider becoming a member and supporting the library and community. If you have been a member in the past and let your membership expire, consider rejoining. Membership forms are available at the library and on-line at www.lakemills.lib.wi.us. If you have questions contact Vicki A. Wickliffe, President of the Friends, at 648-5370. The Friends operates the book sales in the library and at Lake Mills Market. The Friends of the Library is seeking donations of used books in good condition to stock the shelves of the bookcase at the Lake Mills Market. If you have one or two books to donate and you shop at the Market, just place the books on the bookcase shelves. If you have a larger number of books to donate, please contact the library to arrange pickup of your books. We are especially in need of current hardcover or softcover fiction, cookbooks and gardening books. Thank you for your support of the library. Monday, April 15, 2019 10:00 a.m.-noon: Monthly FOL Board meeting. Monday, May 20, 2019, 10:00 a.m.-noon: Monthly FOL Board meeting. Gold level: American Legion Post 67; Culver’s of Lake Mills; Forest Landscaping & Construction Inc.; Jensen Plumbing, Heating and Air; Kuhl Corner Campus Preschool; Lake Mills Area Community Foundation; Lake Mills Main Street Program; Lake Mills Veterinary Clinic; Neuberger, Griggs, Sweet & Schrier, LLP; Pizza Pit of Lake Mills; Re/Max Community Realty; The Corner Mercantile; Topel Truck Center; Watertown Regional Medical Center-Lake Mills Clinic; and Watson Ace Hardware. Silver level: Claussen Funeral Home; Dance Studio 3-D; Dental Associates of Lake Mills; and Legacy Hair Studio. Bronze level: Avid Risk Solutions; Crawfish Junction; Denny’s Hairstyling; Fixmer Agency Insurance; The Grist Bar & Table; and TJS Cabinetry. Contributions from these corporate donors will fund the annual Friends scholarship, an author visit, and other programs. Any other business, civic group, or organization interested in becoming a corporate Friend should contact Vicki Wickliffe, membership chair, at 648-5370 for further information. Download the Membership Form for membership application. Once again (Again?!) 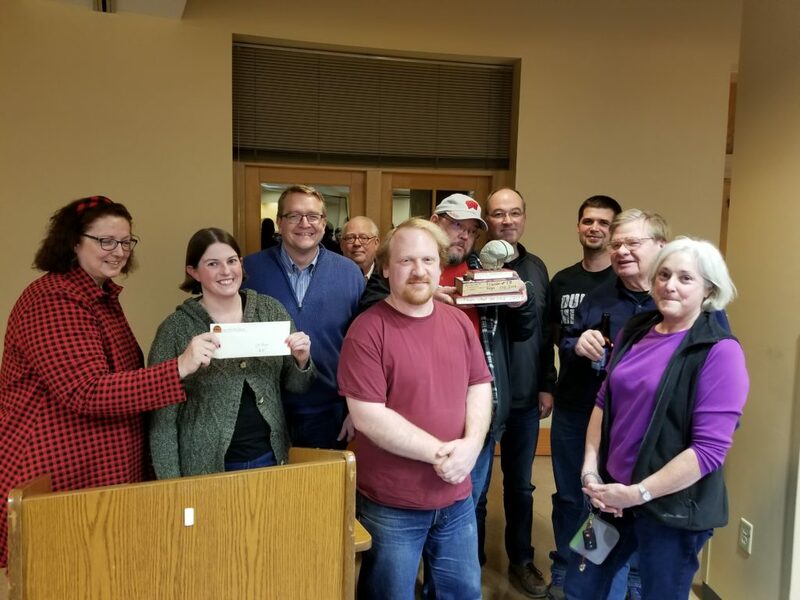 the Friends of the Library were the winning team at the annual Knickerbocker Ice Festival’s trivia night. February 2, 2018. If you know someone who cannot visit the L.D. Fargo Library please let them know the Friends of the Library offer Homebound Delivery. Library materials will be delivered to Lake Mills residents who are unable to visit the library due to temporary or long-term health issues or disability. All circulation library policies apply. Please call the library at 648-2166.